The mysterious Phantom of the Opera will be visiting Europa Village Winery on October 29, just before the spookiest day of the year. But this will be a very special visit, because it will not just be a romantically haunting event. It also includes a five-course, gourmet, French wine-paired dinner, prepared by Europa’s award-winning Executive Chef, Dean Thomas. Europa Village has become well known for its elegant themed dinners that include musical performances, exquisite food, and, of course, the winery’s premier wines. As I have said in previous articles, there are no other events like Europa’s stellar dinners in the Temecula Valley Wine Country. 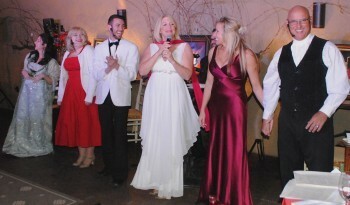 At these dinners, Bev Stephenson, co-owner of the winery, orchestrates musical performances by outstanding singers and dancers who perform throughout the wonderful meal being served. Bev recently emphasized, “We chose Phantom as the focus of this dinner because this is a French-themed wine dinner and Phantom takes place at the Paris Opera House.” She also points out that the less well-known but still hauntingly beautiful script of Phantom of the Opera was written by author Maury Yeston and published by one of the most famous French wine families, the Lafittes. Of course, Phantom is also very appropriate to the season. Performers for this dinner are still being finalized, but you can be assured they will be extraordinary, as they always are. Singers will perform songs from both Maury Yeston’s evocative script and from Andrew Lloyd Webber’s more well-known mesmerizing Phantom with so many unforgettable songs. 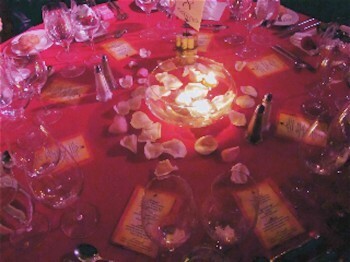 The décor at Europa’s dinners always sets the tone for the evening’s theme. Tables are gorgeously set, usually with flickering candlelight, and this time you will see masks, gothic touches, some autumn glitz, and Europa’s new glistening chandeliers. Of course guests are encouraged to dress for the season in whatever masquerade they choose. This is certainly a stylish way to celebrate Halloween and you can still trick or treat on the 31st. We will be there (but you won’t recognize me) and we hope our friends will join us for this very special event. Tickets are selling out quickly (seriously), but there are still some spots left. You can make your reservation online by going to Europa’s website and pulling down the Events menu. Or call 951-695-7175 to make your reservation. Are you scared yet? I am! Photos taken by Todd Montgomery at previous Europa dinners.